GONE FISHING!!! Perfect gated Investment opportunity or year round home ownership. Key West style gated bay front maintenance free home. Watch the abundant wildlife and dolphins frolic while having breakfast on your private screened in Lanai. Harbour Village is a unique and highly sought-after residential community. First floor unit consists of an open floor plan, full appliance package including washer and dryer. Ceramic tile throughout and french doors to the lanai embracing the water views from your living room, dining, and kitchen area. Vacation year round or bring in that extra income. Great weekly, seasonal or year-round investment opportunity. 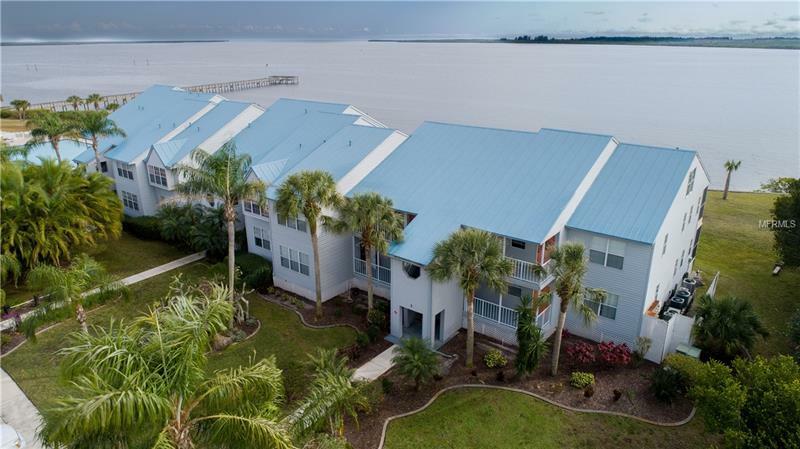 Stay fit and young utilizing the amenities galore including: a huge bay front pool, clubhouse with pool and ping-pong tables, fitness room, deep water boat docks, fishing dock, two tennis courts, boat and trailer storage, picnic tables and gas grills. No fixed bridges to the open water. Pet friendly with no weight restriction. Location is ideal and close to shopping, dining, banking and trophy sized fishing. Brand new 2019 hurricane impact windows to be installed May. Seller financing option available. Furnishings optional providing a turn key rental investment. Live the life most only get to dream about.